PACIFIC • Can AT&T-Time Warner Compete? What's Next: Can AT&T-Time Warner Compete? Judge Richard J. Leon is expected to rule on DOJ vs. AT&T-Time Warner today between 4pm and 5pm ET. The conventional wisdom among the media and industry insiders is that he'll approve the merger with conditions, but anything is possible. The Big Question: Would a combined AT&T-Time Warner actually be able to compete with Facebook, Apple, Amazon, Netflix and Google, aka FAANG? 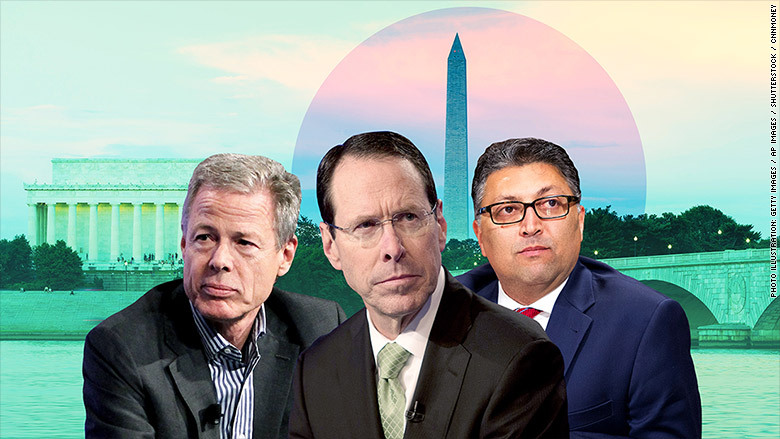 • AT&T CEO Randall Stephenson argued throughout the trial that his company needed Time Warner in order to compete with FAANG, all of which create original content and distribute it directly to consumers. • Stephenson has indicated that AT&T could meld its vast user data and distribution power with Time Warner's powerful content and advertising inventory, giving it the ability to go direct to consumer as well. • FAANG is innovative. They are constantly improving their products, from user interface to stream times to recommendation algorithms. AT&T-Time Warner will have work to do to build a comparable experience. • FAANG is wholistic: They marry programming and distribution strategy. AT&T and Time Warner are different cultures with different priorities, and both sides may be reluctant to play nice with one another. The Big Picture: AT&T-Time Warner will need to think deeply about creating an innovative user interface to distribute its content and inspire its new divisions to work hand-in-hand on programming and distribution. The Counterpoint, via one Hollywood insider: "Tech trends come and go, great content is forever. Looking at the staggering drop off in Facebook use (especially among young people) there is an argument that if this merger goes forward, not only could a post-net neutrality AT&T-Time Warner stand against FAANG, but within 5-10 years it could bump the weaker two (Facebook & Netflix) in terms of strength." Welcome to PACIFIC. We're on edge. My colleagues Hadas Gold and Jessica Schneider are at the courthouse, and we'll be on CNN and CNN International throughout the day with the latest news and analysis on the decision. In case you missed yesterday's PACIFIC, here's my big-picture take on what the ruling means for the future of media. The Big Picture: Ten years from now, half of these companies may have been acquired by the other half. The Elite Eight, most likely: Alphabet, Amazon, Apple, Facebook, AT&T, Charter, Comcast and Verizon. We're still hearing that Comcast will make a formal, all-cash offer of more than $60 billion for 21st Century Fox assets if AT&T-Time Warner is approved. That offer could come as early as Wednesday, our sources say. • "To ensure that Tesla is well prepared for the future, we have been undertaking a thorough reorganization of our company. ... As part of this effort, and the need to reduce costs and become profitable, we have made the difficult decision to let go of approximately 9% of our colleagues across the company." • Musk said the cuts "were almost entirely made from our salaried population and no production associates were included, so this will not affect our ability to reach Model 3 production targets in the coming months." • "Shares of Tesla rose 6% Tuesday after KeyBanc analyst Brad Erickson said in a report that he expects Tesla to deliver 30,000 Model 3 cars in the second quarter, and nearly 120,000 for the full year." • "Erickson previously said he expected deliveries of 20,000 Model 3s this quarter and about 100,000 for all of 2018." • "Tesla's stock is now up more than 40% from the 52-week low it hit back in April. And shares are just 10% from their all-time highs." The Big Picture: We said last month that Tesla needed to demonstrate real, tangible progress to convince everyone other than Musk's most bullish investors that it was still a safe bet. Today, La Monica says "there is a growing sense that not only is demand extremely strong for the Model 3, but that Tesla will actually be able to meet it." What's Next: People watching other people play video games. At least 68,000 people are currently gathered at the Los Angeles Convention Center for E3, the gaming industry's big annual conference, where one of the major trends on display is the rise of eSports. • More than 360 million people watched a 2017 "League of Legends" eSports competition, eclipsing the 111.3 million who watched that year's Super Bowl and the 30 million who watched that year's NBA Finals. • eSports is expected to be a $1 billion business by the end of the decade, according to various market researchers, but spending on streaming and TV rights in the US today is just $34 million. • The Information's Matt Pressberg says the industry "needs to improve measurement of its audiences on streaming services before it can strike rich pro sports-style TV deals." Bonus: If you want to get an idea of how real this is, watch the 2017 "League of Legends" Final Opening Ceremony. Back in 2016, Bill Gates, Jeff Bezos, Jack Ma, Mukesh Ambani and Richard Branson launched Breakthrough Energy Ventures to invest at least $1 billion in creating new technologies to combat climate change. • Form Energy will work to create a new type of battery that can store energy for weeks or months and costs less than $10 per kilowatt hour. • Quidnet Energy will work to store energy in water by pumping it into underground shale rock, avoiding the reliance on rivers and dams. The Big Picture: "The way to reach the world's climate goals is straightforward: reduce our greenhouse-gas emissions to zero within the next few decades. ... BEV's $1 billion fund [invests in] companies working on technologies capable of cutting global carbon emissions by at least 500 million metric tons annually, even if they may not provide returns on investment for up to 20 years." • "The council said it will hold a vote Tuesday and signaled it would reverse its earlier move." • "The tax of $275 per employee ... was expected to raise almost $50 million a year for homeless services and affordable housing." • "Amazon and other major employers in the city had vocally opposed the tax." The Big Picture: As we wrote at the time, this was one of the biggest fiascos in the city's history as a leader of progressive policy. The majority of Seattleites were against it, and it threw an unnecessary wedge between the city's political and business communities. But ... We still believe there is a massive opportunity for progressive politicians and tech leaders in Seattle and Silicon Valley to innovate on solving the housing and homelessness crises in their communities. What next: "Why Do We Care So Much About Privacy?" by The New Yorker's Louis Menand: "Big Tech wants to exploit our personal data, and the government wants to keep tabs on us. But 'privacy' isn't what's really at stake."